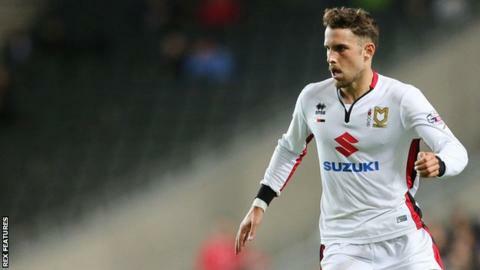 Charlton Athletic have re-signed Diego Poyet on loan after the midfielder was recalled from his loan spell at MK Dons by parent club West Ham. Poyet came through the youth ranks at The Valley but left in the summer of 2014 to move to the Boleyn Ground. The 20-year-old made 20 appearances for MK Dons after joining in August but he only started two games last month. He will remain with the south-east London club until the end of the season and is eligible to play in the FA Cup. "I'm very proud to have Diego back," Charlton interim head coach Karel Fraeye told the club website. "He's a player who is not afraid on the ball and, although he is very young, he has played a lot of games in the Championship already. "Everyone in the building is so happy to see him back." Poyet, who has represented England and Uruguay at youth international level, made 23 appearances for Charlton in 2013-14 and was voted the club's player of the year by supporters. He has played 10 times for the Hammers and featured in the Europa League this season before joining MK Dons on a season-long deal in August. Poyet becomes Charlton's third signing of the January transfer window following the arrivals of Middlesbrough's Rhys Williams on loan and fellow defender Roger Johnson on an 18-month deal.